Studio visit on May 28, 2014 in Bushwick, Brooklyn, New York. I met Polly Shindler at her Pratt studio in 2011. She was one of the first artists to make an impression on my fresh-to-New-York curiosity and naivety, yet she did not remember me when I contacted her for another studio visit. I emailed Polly last month, in May 2014, after watching her career and work develop over the past three years. In that time, we have both graduated from our respective, and respected, MFA programs. We are both trying to balance studio practice with real life and still reflecting on the MFA experience. 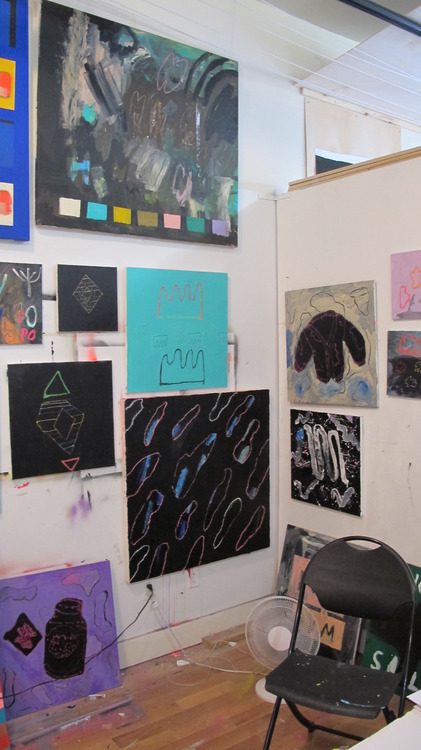 I visited Polly in her studio on May 28, 2014 as she was preparing for the Bushwick Open Studios. Her walls were filled with whimsical and playful acrylic abstractions and nonsensical text pieces with phrases such as “horse feathers,” “word salad,” and “SMART!” I immediately noticed the range of working styles and depth of exploration. In the vast limitlessness of abstract painting, much like a storage basement, Polly is able to excavate joyful relics, shiny, pretty things, and masterful renditions. Polly and I continued to talk for about 45 minutes, below is a transcription of our conversation. Polly Shindler: You live here right? Keith Hoffman: Yes, I live in the Lower East Side. PS: I have a question about how we know each other? Is it Nick Naber, maybe? KH: I was going to explain…I moved to NYC a year before going back to school. I visited all the open studios and MFA shows and your open studios at Pratt. You were one of the first artists that I reacted to in a strong and positive way. KH: But, yes I do know Nick. And that is a coincidence. I met Nick while installing a show. I was working for the artist; he was working for the gallery. We have kept in contact and he asked me to join this project, The Coastal Post, wherein we do interviews and studio visits with artists outside of our immediate social/professional circles. The project seems to be wrapped in the MFA experience as contributors and participants all have, or are earning, MFAs. So, when I was deciding whom to interview, I thought about going full circle, so to speak, and returning to your work. And I do love your work! KH: So tell me about the beginning of your MFA experience. What brought you to the point of applying to school? PS: I was working at an art store right next to the Yale School of Art. I saw a lot of art there. And I used to do more architectural work…a lot of building and trains. After working at the store for so long and seeing all these art students come and go, I thought, “I’m gonna do this! I want to do this for real.” So I applied to a bunch of places and got into Pratt. And I went to Pratt. KH: So that is when you moved to NY? For school? PS: Yes! I never wanted to live in New York, but I thought this is what I want to do, so I should probably be here. KH: Do you still want to be here [in New York]? PS: It ebbs and flows, you know. About this time last year, I thought, “life is too hard here.” But my circumstances changed, for the better, and now I think, “Where am I going to go?” I loved living in Austin TX, but I got nothing from it. It’s a beautiful place to live, but people aren’t … and I feel like this is making it work. I’m obviously not making a living off of this [art], but I work 3-4 days a week. I have a job for that reason. I don’t have a conscious thought while I’m there. Our lives can be so solitary in the studio, at home, I’m glad I have a job where I am forced to talk to people. And be nice to them. It is good for my brain to be social. You don’t realize that being around all these people is different thanengaging [with them]. KH: Are you still social with your classmates [from Pratt]? PS: Yeah, I mean…I see them more than anyone else. These [studio mates] are my best friends. We have a really nice ah…I talk to Will [Hutnick] everyday! We are like bookends. We are both in relationships but I still feel like he is my other half. We share part of the same brain. KH: And has he [Will] has shared this studio with you the entire time? KH: It doesn’t seem sustainable at first, but you learn your ways. I’ve been less interested in showing my work in the climate and scene of what is going on today. I’m more about creating a space to show work rather that altering my work to fit into someone else’s space. I’m uncompromising with my work, so that is why I am building these other projects, creating space and involving/inviting artists that I respect and want to collaborate with. That has been my focus since graduating. And I am interested in supporting other artists. PS: I go back and forth. I love curating. But I have to decide where I want my energies. Will and I have curated a few shows and I love that. But I have to be in a certain mindset. I learn so much. So I guess I’m not so much in my little world. KH: Are there any recent shows that you have really liked or that you have thought about a lot? PS: I went to an art crit group and I was introduced to 10 new artists. This woman, MegAtkinson blew my mind. It is text-based work; her palette is really cool. Will and I always have this show in our heads, a roster that we keep adding to. And she just got put on it. I’d love to see her…There is that part of you that wants to show someone something awesome. I haven’t seen something like that, her touch, in a long time. But I don’t get out to shows as much as I should. KH: Do you feel bad about it? Why? PS: Yes, because I feel selfish…for wanting to work on my own things and not wanting to go out. The last big show I went to was Volta - a couple months ago. I loved some things I saw. I am now obsessed with Paul Wapers. Oh my god! I just think he is phenomenal. I just want to eat it. His work is so good. And what I love about it is that it is representational, but in a very sort of absurd way. KH: There is a lot of pressure to see as many shows [art exhibitions] as possible. And there is a lot of judgment for what you didn’t see. But you must decide your saturation point. You quickly realize that seeing every show eats your time and doesn’t always help with the working process. KH: What would you like people to address when discussing your work? PS: I like when people tell me what they see. It helps me hone down. Because so much of what I do it intuitive. A lot of times there is a plan but then things happen. Different things happen while you are painting. But my work was much more cut-and-dry when I was in school, now I’m doing everything. KH: Because your work has changed a lot? PS: Yes, it used to be much more thematically concise. Like Oh! Everything in here in a color, and has gold leaf, and it’s a strong symbol. And now everything is all over the place. Because you can’t do the same thing for too long. I don’t want to be the one-trick pony. I don’t want to be “that gold leaf girl.” But I want to do everything that is in my brain. KH: How quickly do you work? PS: Very fast. Extremely fast. I can’t start a painting and leave the studio until I know where it is going. I’ll do three paintings in a day. I might paint over them in a year. KH: Is this your set-up for the [upcoming] open studios? PS: I’ll probably change it around. It will be salon style, but I can’t show everything. I did a residency in Vermont this last year and I decided to work really large, which was great, but now the paintings are just rolled and in the closet. I’ll show as much as I can! KH: Are you mixing many materials? PS: They are all acrylic! And I use spray paint, glitter paint, varnish. I stopped using oil long ago. I need things to dry quickly. I may use oil bar or oil stick here or there. But I don’t have the patience for oil anymore. KH: Do you ever paint representationally? PS: It’s not really where my interests lie. I really am so interested in seeing what paint can do…and mixing paint and getting the right viscosity is so fun for me. Having to deal with anything else besides that is… Well, this [pointing] is the first thing that I’ve painted that isreal. I feel like…why not? They are more absurd. But I like when art is funny. I want something to be winking at me a little bit. And why not? If it came to me and its funny andcould look cool. Not because its brilliant or creative, but because it’s just stupid. And that’s what I like about it. KH: In a painting like this, are there many compositions that have been reworked? Is that what I can see in the texture? PS: Yes, that has been a lot of different paintings. This is just where is it right now. It might be different in a year. I have documentation of this but it might change. KH: When do you say a painting is done? KH: Are any of the works in series? Or just “one-offs”? PS: You know… I make them in series. I made these [pointing] all around the same time. But I like them all together [as a group]. They are sillier together. And this one [pointing] is sort of Saved by the Bell. Do you notice how everything looks like Saved By the Bell with floating geometry, pop colors and gradients? Or Squiggle Vision where everything in squiggly and jumpy? KH: Yes, of course I know the Saved by the Bell look, which appropriately indicates my age. And leads me to my final question… How old are you? PS: I’m 37…So that is that! That is my story!